Millions looks pretty optimistic. 60 cars times 10 thousand bucks is only 600 thou, and if those two pictures are typical, those cars won't average anywhere near 10 grand a pop. All the baloney that goes along with these types of stories. I'm sure there are plenty of people who knew about this hoard for many years. 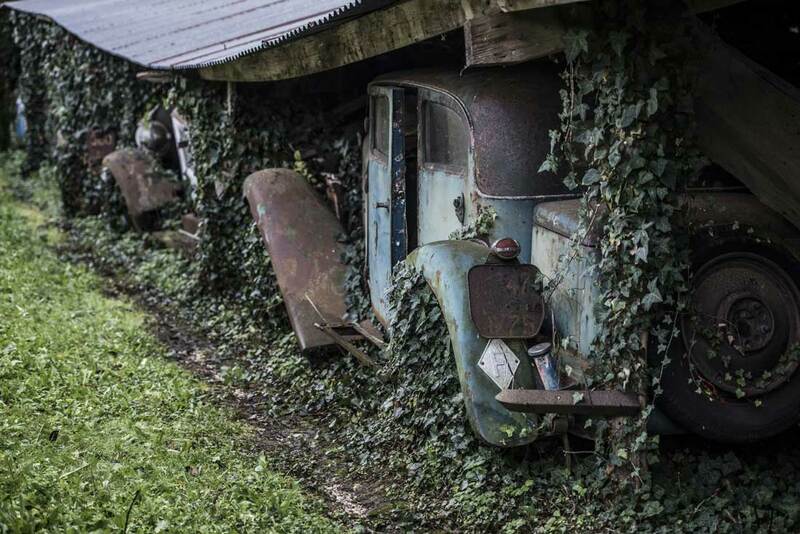 Also - there's nothing like poor storage to ruin an antique car. There are some big buck cars in this collection. Take a look at the link. "All the baloney that goes along with these types of stories." You need to look ALL THE CARS and the REST OF THE PHOTOS before you jump to an incorrect conclusion. I just showed some of the cars you guys would be interested in. The collection also contains a Bugatti (below), Talbot Lagos, a Hispano-Suiza (above) and a Ferrari that is valved at 10-12 million dollars. There are also quite a few cars with custom built coachwork by the best builders in the world. It is going to be the auction of the century and people will be talking about it for years. Bugatti, Hispano-Suiza, yep those will bring big bucks even looking the way they do. Wow. 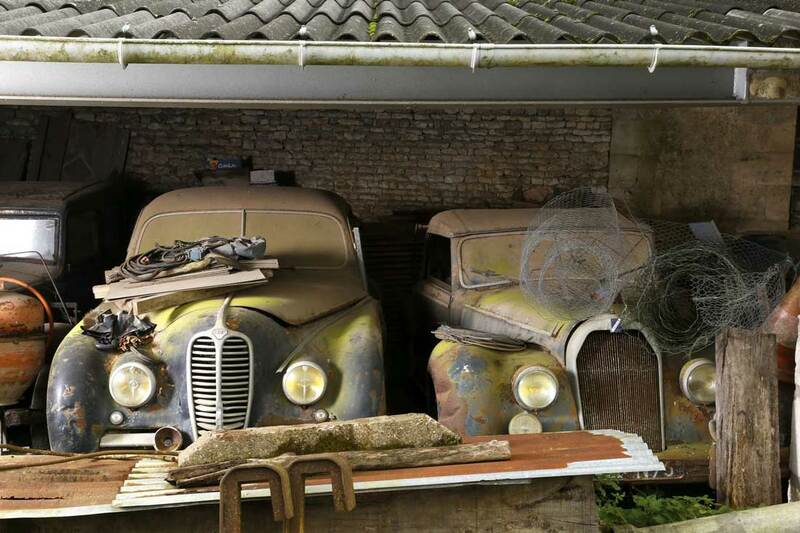 While it is true that these cars should have been better cared for, or sold off years ago? For most of them, it is not too late. This sale should go into a few million USA dollars. I could not identify more than half the cars. 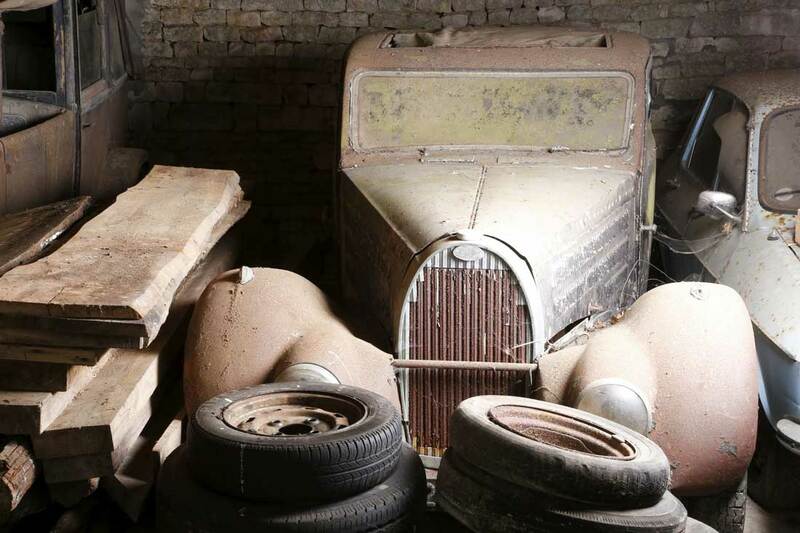 There were a few '20s/'30s Citroens, (not very valuable), An American early '60s sedan, a '60ish Porsche coupe (decent condition, but not particularly valuable) and a bunch of odd and modified remains of things probably not worth much. To balance that, there were also a couple Talbot Lagos in very restorable condition, At least one Delahaye (neat looking for a late '30s), a high end Bentley from the '30s, several other recognizable large classics and sports cars from the late '20s and '30s. There were several recognizable custom body works on European classics, Some of them "to die for" (if you can pardon the quote). 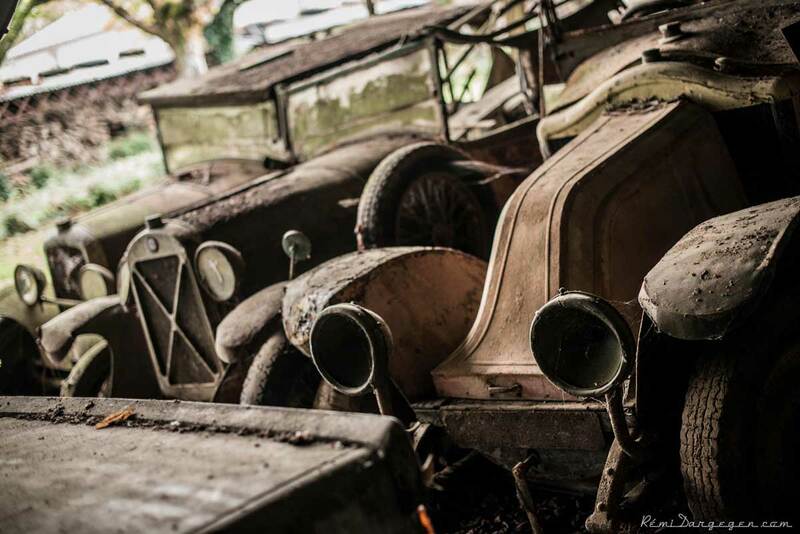 Many millions of dollars will be spent on the restoration of these incredible cars! 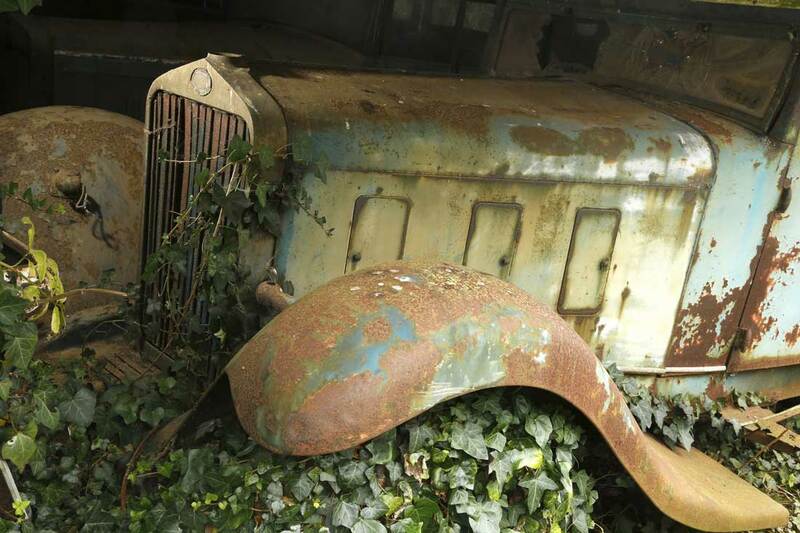 There could be two dozen cars there that will be invited to Pebble Beach once they are restored (or properly preserved). In addition to the cars I mentioned already, were three I decided to save for last. Not one, but two Ferraris, One from the '50s in fair condition, the other from the early '60s that actually looks pretty decent (at least the little bit of it that could be seen in the video). 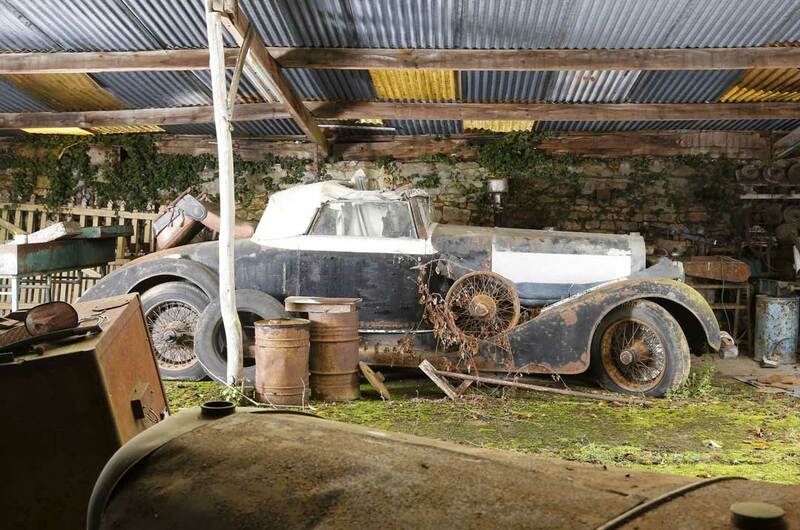 There is also a mid '30s Bugatti coupe. The total sale price for these three cars alone could go into the multiple millions of dollars. About time this treasure came back into the world. Thank you David G for sharing this here (although I would have seen it tonight when I checked your site). Is this the collection that is in Portugal? I would like to have that long black 2 door thingy first in 1 of davids postings.I like! Oh I wouldnt say they were forgotten, Im sure the guy that had them knew very well where they were. Very nice collection. I know a guy that has a barn full of very rare one of a kind hit and miss engines. They just sit there collecting dust. There is a bunch of collectors that watch the obits just for that reason. Im thinking thats why this auction is happening. Gotta be in some foreign country...not USA building construction. 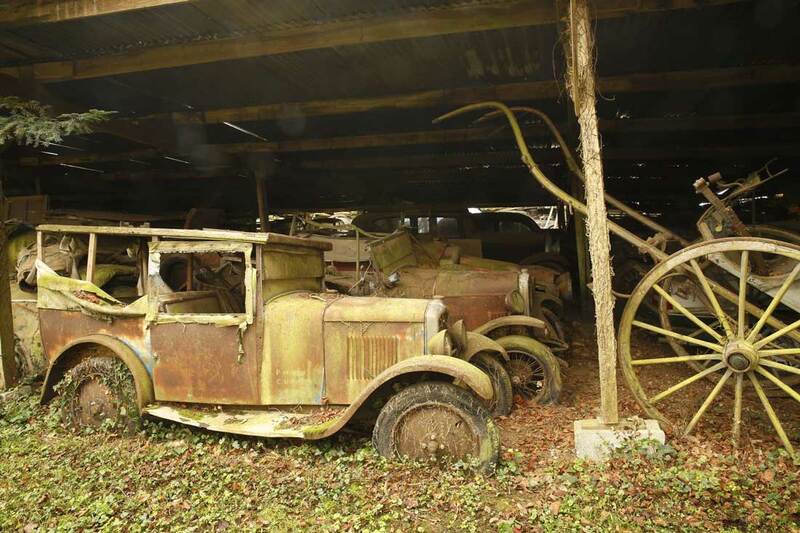 It is interesting that the prewar II cars survived the war. They may have been in "Free France" - there was no fighting or bombing in Free France. I wonder if that Ferrari California will be worth more or less than a nice, restored example. Just last weekend, I toured a garage of very similar cars that were restored. The man who was showing me the cars mentioned the value of each car. All the values were reasonable and exactly what I expected to hear except for one car which surprised me a bit. 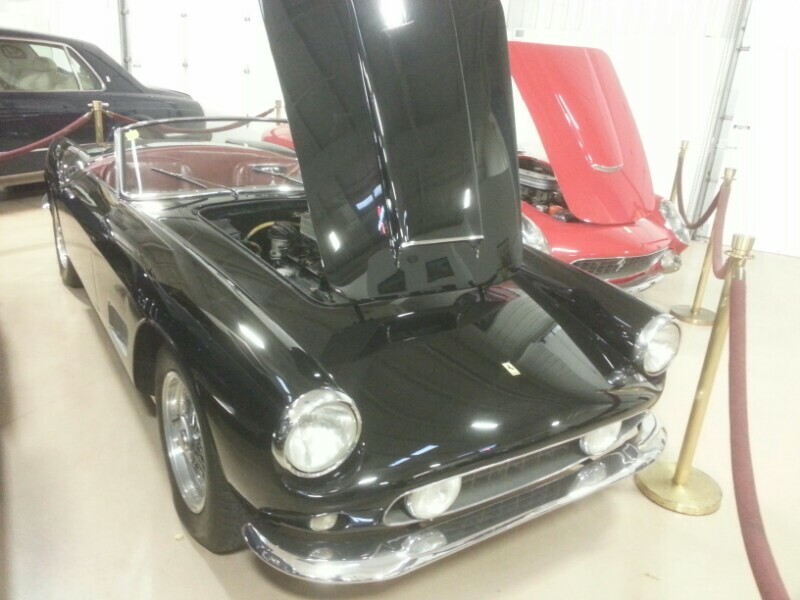 It was this '60 or '61 Ferrari which he said is worth ten million dollars because it is so rare. I'm no Ferrari expert but to me, it looks like that one in France. Regardless, there's lots of money in that shed. David G! You slipped in ahead of my slow typing! I don't know one Ferrari from another. I know they range in price from about 100K to more than ten million dollars for decent cars, and the older one I saw in the video should be on the high side of desirability (I don't know about its condition, it is rusty). I look forward to hearing about the auction results. I hope there will be more and better photos of the cars. Almost all of those I have seen in the photos are newer than my primary interest (as if I could ever afford any of these things anyway). But some of that European custom car stuff is just fantastic! How can that be called a collection? Theres not a T in the bunch! It can't be worth That much! I don't see any Model T's. 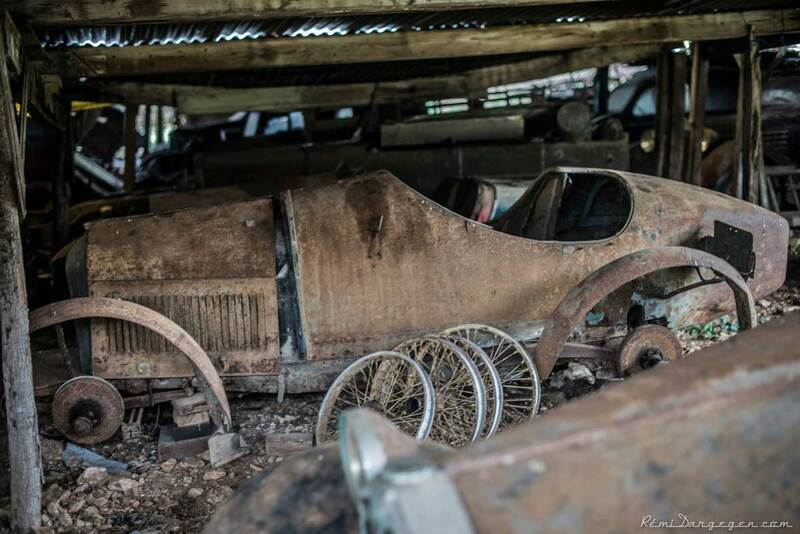 I want the Bugatti and enough money to bring it back to life. Next to a Model T the old Bugatti roadsters were the most beautiful cars ever built. I'll take one of those before I'd take 10 of those Ferrari things. worth what the person who wants it is willing to pay. 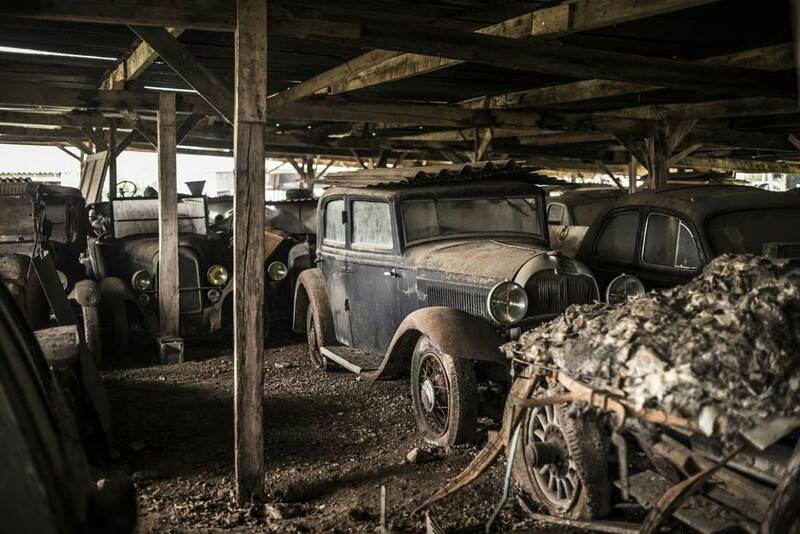 I have seen $1,000 cars at auction sell for up to three thou. Not antique treasures. We are merely caretakers of our automobiles. It looks like somebody apparently didn't take care. I would not say he did not care, as there might have been a reason why the cars were left the way that they were that we don't know about. I will report more about this when we learn more. One person commented that it looks like "60 piles of useless rusted garbage"
I wish I had some of that "useless rusted garbage" in my back yard!